It must feel pretty empowering, knowing that a pluck of your guitar string causes a wave of light to sporadically spike across a giant projector screen, seamlessly putting thousands of spectators into a perpetual hypnotic daze. That’s Kevin Parker’s job. The Tame Impala chief and his band pull you into a trance with their seemingly endless beats, and then suddenly burst into epic choruses that make you feel like you’ve just woken up from a dream. It’s like a psychedelic alarm clock, plus confetti. Yes, confetti. So much confetti. Like millions of little pieces of paper. Everywhere. That’s how they started their show this Sunday at the Bell Centre, right at the climax of Let It Happen. Off of their newest album “Currents”, the song is 8 minutes of keys changing, dancy drums fading in and out, and synthy beeps synthily beeping. It’s a good intro to an album and also a rock concert. They played hits from all three albums, with Parker introducing many of the songs, including Elephant. “Now’s when the real party starts”, he said, and the headbob-inducing guitar rhythm enveloped the stadium. “Get out your lighters for this one”, he told us before going into Yes I’m Changing. He even grabbed a lighter from one of the audience members and waved it along with the rest of the crowd. Cute. The highlight of the night, though, was the light show (The confetti was a close second). It was captivating. It was psychedelic. It was reminiscent of Pink Floyd’s laser show. Blasts of intense colour and shapes flashing on the huge projector screen behind the band made it hard to look away. Each song had a different arrangement. Alter Ego, which already sounds like Rainbow Road (Mario Kart), had what was like a multi-coloured version of the Millennium Falcon (Star Wars) jumping into light speed (theoretically impossible). It made me wonder if the inspiration for that song really was the Beatles ‘Tomorrow Never Knows’ (asserted by random internet blogger). Tame Impala used an oscilloscope for most of their set, which turned their instruments’ sound waves into images and projected them. At one point the band stopped playing, except for Parker, who slowly plucked what seemed like random notes on the guitar, and giant green contours flashed across the screen. It made for quite a mesmerizing few minutes. And then BAM, they burst into It Is Not Meant To Be, and I realized I was awake again. During the encore, the beat dropped on Feels Like We Only Go Backwards, and you guessed it: More confetti. So much more. It was too much. The confetti guns were in non-stop, blinding-everyone, where-did- they-get- all-this- confetti mode. Parker exclaimed that most of it was getting on the stage, and you could see the band shaking it out of their long hair and spitting it out of their mouths. It was hilarious. For me. Because I didn’t have confetti in my mouth. An oddly satisfying end to the night. 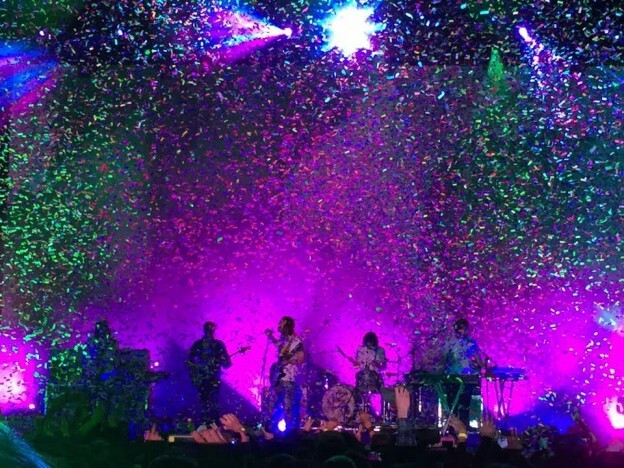 This entry was posted in Reviews and tagged Confetti, Lights, Tame Impala on June 20, 2016 by librarian.